For almost six months, the family and friends of imprisoned Vietnamese lawyer and activist Nguyen Van Dai have been waiting to hear what will happen to him. Dai was arrested on 16 December 2015, hours before a planned meeting with EU officials in Hanoi. Since his arrest, his wife has not been allowed to send a Bible and newspapers, and his lawyer has been denied a meeting. An EEAS [the EU foreign service] statement on 18 December stated that Dai’s arrest “goes against Vietnam’s international human rights obligations”, and called on the Vietnamese authorities to release Dai immediately, and to conduct an investigation into the assault perpetrated against Dai a few days earlier. Neither of these requests has been addressed. Nguyen Van Dai is a well-known human rights lawyer and pro-democracy activist who has provided legal advice and representation to victims of human rights abuses - including religious minorities - across Vietnam. He is also one of the original signatories of Bloc 8406, a manifesto on freedom and democracy in Vietnam. Vietnam’s human rights record is not often in the spotlight. The UN member state acceded to the International Covenant on Civil and Political Rights in 1982 and in the same decade embarked on a period of economic reform referred to as doi moi. The past three decades have seen significant economic development as well as some growth in the level of civil society activity and limited improvements in online freedom. 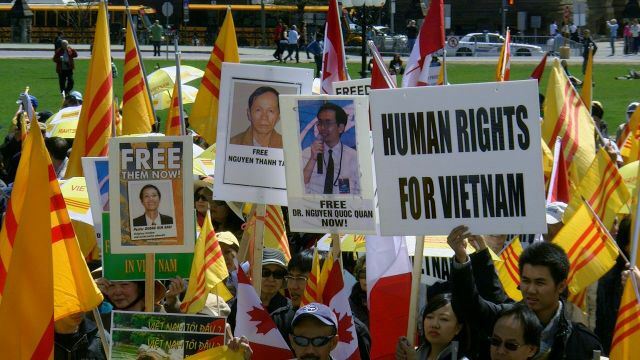 Vietnamese activists, however, say Vietnam fails to respect international human rights standards and actively pursues human rights defenders. A 2014 report authored by members of the group Former Vietnamese Prisoners of Conscience, including Nguyen Van Dai, logged hundreds of violations against activists, bloggers, petitioners and religious figures including travel bans, assaults, arrest, torture and imprisonment. Between 2006 and 2014, the most common criminal charge brought at dissidents was “conducting propaganda against the Socialist Republic of Vietnam” (Article 88 of the Penal Code). It is under Article 88 that Nguyen Van Dai and colleague Le Thu Ha, who was arrested on the same day, are now detained. Dai has already served a four-year prison sentence after being found guilty under the same article. The EU has acknowledged many of these issues and has raised concerns during the annual EU-Vietnam human rights dialogues about national security provisions in the Penal Code and the harassment, arrest and detention of human rights defenders and religious followers. However, these concerns do not seem to have found their way into other aspects of the EU’s relationship with Vietnam. A glance at trade relations raises serious concerns. The EU is one of Vietnam’s largest trade partners, and the EU-Vietnam Partnership and Cooperation Agreement (PCA) is founded on the “respect of human rights and democratic principles”. Yet new EU-Vietnam trade agreements are being fast-tracked with barely any attention to human rights. Last December, the EU concluded three years of negotiations on a Free Trade Agreement (FTA) with Vietnam. In principle, FTA negotiations must be preceded by a Human Rights Impact Assessment to ensure that trade does not negatively impact the enjoyment of human rights. This is very important for Vietnam, especially in major export sectors such as the textile and garment industry where working conditions are extremely poor. There are no independent trade unions in Vietnam and the right to strike is severely restricted, even prohibited in many sectors. As a result, Vietnamese workers, most of whom are women, have no mechanisms to defend their rights. Disturbingly, and despite serious evidence on Vietnam’s human rights abuses raised in recent European Parliament resolutions, the European Commission waived this mandatory requirement and announced that a human rights impact assessment was not necessary for Vietnam. Two human rights NGOs, the Paris-based FIDH and Vietnam Committee on Human Rights, brought the affair before the EU Ombudsman. After a year of thorough investigation, Ombudsman Emily O’Reilly declared that the complaint was well founded. She charged the European Commission with “maladministration”, and demanded that the assessment be conducted without delay. Instead of implementing her recommendations, the EC accelerated negotiations with Vietnam, and the EU-Vietnam Free Trade Agreement was signed in December 2015. It still needs approval by the EU Council and European Parliament. The inconsistency of EU policies and practices shocked many MEPs. In a heated debate in the EP human rights sub-committee in March at which the EU Ombudsman gave testimony, MEPs expressed amazement that “the EU’s right hand doesn’t know what its left hand is doing”. The committee’s chair, Elena Valenciano, described the affair as a “dangerous precedent” and called for a review of this and other current bilateral trade negotiations. Such inconsistency undermines the EU’s legitimacy and harms solidarity with people on the ground. Nguyen Van Dai placed his trust in the EU, enough to put his safety on the line to meet EU officials in Hanoi. He is now in jail, and risks a harsh sentence on completely illegitimate charges. Public statements on his plight are important, but they are not enough. The EU disposes of a whole range of policy tools, including a “human rights clause” in the PCA that allows it to suspend trade if grave human rights violations persist. It should use these tools to press Vietnam to respect its binding bilateral engagements - and to begin by setting Nguyen Van Dai free.